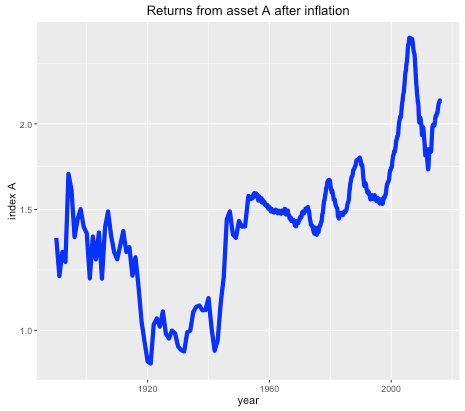 Long term historical return of asset A, after inflation, log scale. It seems that the real price of the asset hasn’t gone anywhere in the last 125 years, with an average compounded growth rate of about half a percent. The asset also appears to be needlessly volatile for such a poor performance. 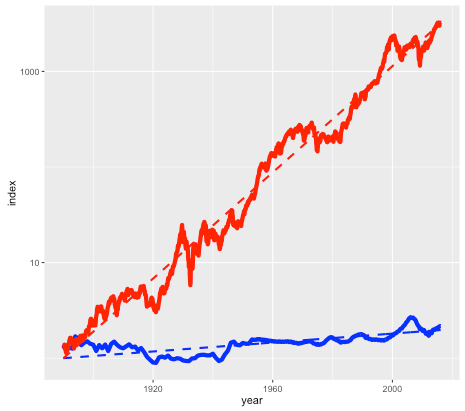 Long term historical return of assets A (blue line) and B (red line), after inflation, log scale. Note again this is a log scale, so asset B has increased in price by more than a factor of a thousand, after inflation, since 1890. The average compounded growth rate, after inflation, is 6.6 percent – an improvement of over 6 percent compared to asset A. On the face of it, it would appear that asset B – the steeply climbing red line – would be the better bet. But suppose that everyone around you believed that asset A was the correct way to build wealth. Not only were people investing their life savings in asset A, but they were taking out highly leveraged positions in order to buy as much of it as possible. Parents were lending their offspring the money to make a down payment on a loan so that they wouldn’t be deprived. Other buyers (without rich parents) were borrowing the down payment from secondary lenders at high interest rates. Foreigners were using asset A as a safe store of wealth, one which seemed to be mysteriously exempt from anti-money laundering regulations. In fact, asset A had become so systemically important that a major fraction of the country’s economy was involved in either building it, selling it, or financing it. You may have already guessed that the blue line is the US housing market (based on the Case-Shiller index), and the red line is the S&P 500 stock market index, with dividends reinvested. The housing index ignores factors such as the improvement in housing stock, so really measures the value of residential land. The stock market index (again based on Case-Shiller data) is what you might get from a hypothetical index fund. In either case, things like management and transaction fees have been ignored. So why does everyone think housing is a better investment than the stock market? Of course, the comparison isn’t quite fair. For one thing, you can live in a house – an important dividend in itself – while a stock market portfolio is just numbers in an account. But the vast discrepancy between the two means that we have to ask, is housing a good place to park your money, or is it better in financial terms to rent and invest your savings? As an example, I was recently offered the opportunity to buy a house in the Toronto area before it went on the market. The price was $999,000, which is about average for Toronto. It was being rented out at $2600 per month. Was it a good deal? Usually real estate decisions are based on two factors – what similar properties are selling for, and what the rate of appreciation appears to be. In this case I was told that the houses on the street were selling for about that amount, and furthermore were going up by about a $100K per year (the Toronto market is very hot right now). But both of these factors depend on what other people are doing and thinking about the market – and group dynamics are not always the best measure of value (think the Dutch tulip bulb crisis). A potentially more useful piece of information is the current rent earned by the property. This gives a sense of how much the house is worth as a provider of housing services, rather than as a speculative investment, and therefore plays a similar role as the earnings of a company. And it offers a benchmark to which we can compare the price of the house. Consider two different scenarios, Buy and Rent. In the Buy scenario, the costs include the initial downpayment, mortgage payments, and monthly maintenance fees (including regular repairs, utilities, property taxes, and accrued expenses for e.g. major renovations). Once the mortgage period is complete the person ends up with a fully-paid house. For the Rent scenario, we assume identical initial and monthly outflows. However the housing costs in this case only involve rent and utilities. The initial downpayment is therefore invested, as are any monthly savings compared to the Buy scenario. 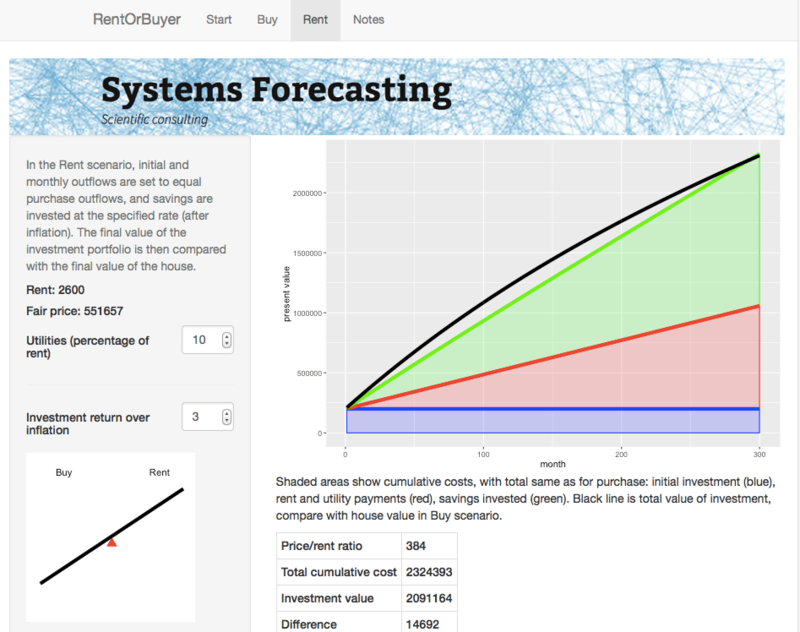 The Rent scenario therefore has the same costs as the Buy scenario, but the person ends up with an investment portfolio instead of a house. By showing which of these is worth more, we can see whether in financial terms it is better to buy or rent. The RentOrBuyer app allows the user to compare the overall cumulative cost of buying or renting a home. 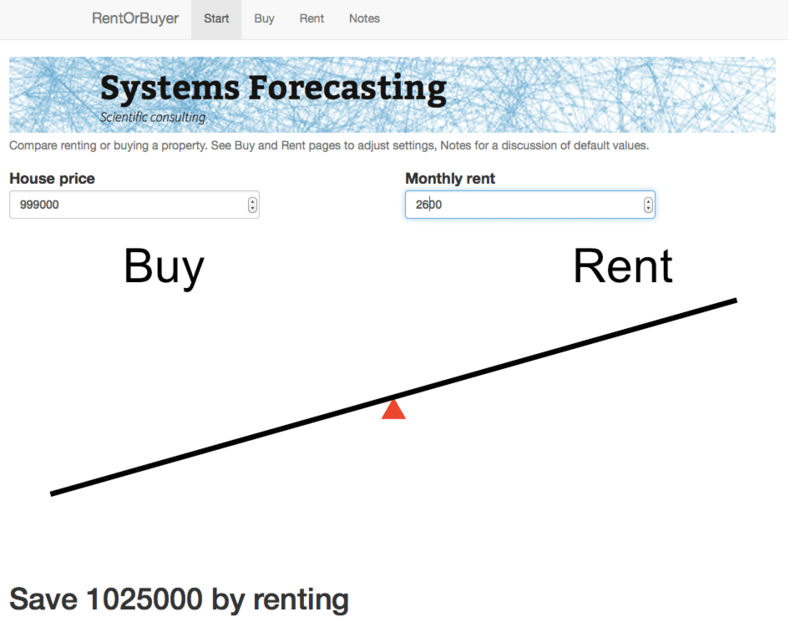 The Rent page gives details about the rent scenario including a plot of cumulative costs. For the $999,000 house, and some perfectly reasonable assumptions for the parameters, I estimate savings by renting of about … a million dollars. Which is certainly enough to give one pause. Give it a try yourself before you buy that beat up shack! Of course, there are many uncertainties involved in the calculation. Numbers like interest rates and returns on investment are liable to change. We also don’t take into account factors such as taxation, which may have an effect, depending on where you live. However, it is still possible to make reasonable assumptions. For example, an investment portfolio can be expected to earn more over a long time period than a house (a house might be nice, but it’s not going to be the next Apple). The stock market is prone to crashes, but then so is the property market as shown by the first figure. Mortgage rates are at historic lows and are likely to rise. While the RentOrBuyer can only provide an estimate of the likely outcome, the answers it produces tend to be reasonably robust to changes in the assumptions, with a fair ratio of house price to rent typically working out in the region of 200-220. Perhaps unsurprisingly, this is not far off the historical average. Institutions such as the IMF and central banks use this ratio along with other metrics such as the ratio of average prices to earnings to detect housing bubbles. As an example, according to Moody’s Analytics, the average ratio for metro areas in the US was near its long-term average of about 180 in 2000, reached nearly 300 in 2006 with the housing bubble, and was back to 180 in 2010. House prices in many urban areas – in Canada, Toronto and especially Vancouver come to mind – have seen a remarkable run-up in price in recent years (see my World Finance article). However this is probably due to a number of factors such as ultra-low interest rates following the financial crash, inflows of (possibly laundered) foreign cash, not to mention a general enthusiasm for housing which borders on mania. The RentOrBuyer app should help give some perspective, and a reminder that the purpose of a house is to provide a place to live, not a vehicle for gambling. Try the RentOrBuyer app here. Housing in Crisis: When Will Metro Markets Recover? Mark Zandi, Celia Chen, Cristian deRitis, Andres Carbacho-Burgos, Moody’s Economy.com, February 2009.